Horses have delicate lungs and are very sensitive to dusts, pollens and mold spores; exposure to these irritants over time can damage them. Once a horse develops COPD there is little that can be done, beyond keeping it comfortable. It is similar in many ways to human COPD. Many horses live long lives the mild COPD, but it does require vigilance to ensure the horse isn’t overworked, or in an environment that might make the COPD worse. While there’s no cure, with good management, most horses with heaves can be comfortable and can be lightly worked. Here’s how COPD develops and what you can do to help your horse. COPD may also be referred to as Chronic Obstructive Pulmonary Disease, Equine Asthma, Emphysema, or Broken Wind. It is most commonly known as ‘heaves’. COPD can be caused by dusty or moldy hay, dust and molds in stall bedding, or pollens, dust and other irritants in the environment. Any horse exposed to respiratory irritants may develop COPD. The longer they are exposed, the more severe the condition may become. 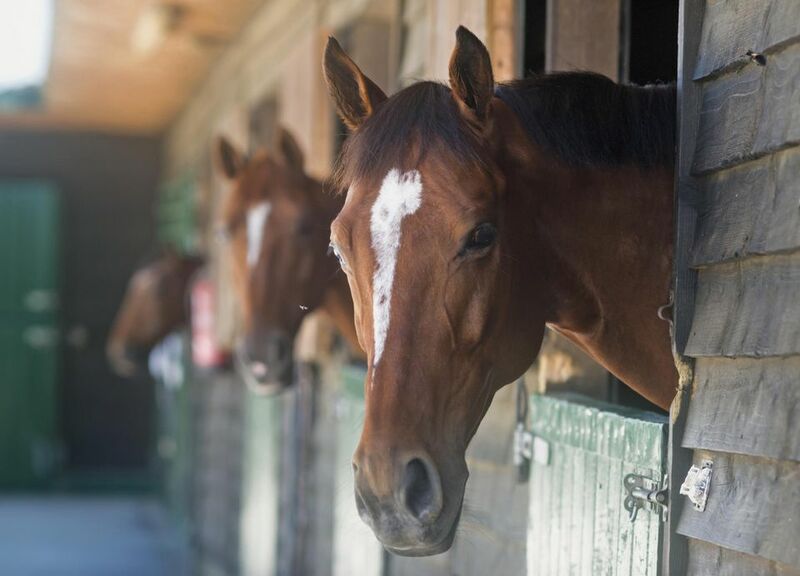 Horses kept stabled may be at higher risk. Horses that develop severe respiratory infections may also be left with lung damage that results in COPD. The symptoms of COPD are coughing, increased respiration, labored breathing, and yellow nasal discharge. Symptoms range in severity from mild, to so severe that the horse appears listless, has difficulty breathing, and develops a muscular 'heave line' along the horse's barrel from taking a double exhalation to push the air out of its lungs. An elevation in body temperature is not a symptom of COPD but of an infection. The horse's appetite should remain normal unless the condition has developed so the horse has extreme difficulty breathing while eating. While the horse is working, the symptoms may become more apparent as the horse labors to breath. This chronic lung condition builds gradually. If recognized early, good feed and stable management may slow or prevent its progression and the horse may be able to take on an almost normal workload. If the horse is continually exposed to the irritants the disease may progress to the point where the horse is unable to thrive. Mares may have a more difficult time breathing as their pregnancy progresses. Severe cases can leave a horse struggling for every breath. Good stable and feeding practices can help avoid and control COPD. Make sure that any fodder and bedding is mold and dust free. Clean hay and a well ventilated stable are essential for keeping your horse’s lungs healthy. Outdoor turnout is the best way to provide lots of fresh air. A veterinarian will be able to suggest drug therapy to help alleviate symptoms and some owners find various herbal or natural remedies effective. There is no cure; once a horse has COPD, it will always be at risk of further lung damage. Once a horse gets COPD, it's important to protect it from dust and allergens that may exacerbate the condition. Ongoing drug therapy may help a horse that has problems breathing while at work. An inhaler that disperses medication, somewhat like the inhalers used by people with asthma, but made to fit over a horse's nose, may be used to sooth the horse’s airways.